Kim Hollis: Ricki and the Flash, Meryl Streep's latest starring effort, earned $6.6 million. What do you think of this result? Matthew Huntley: Eh, this an okay opening weekend and more or less right on target with my expectations given the material and marketing campaign, as well as the number of theaters that were showing it. I don't think the studio will turn a huge profit, if any, on the $18-million drama, but they won't lose a bundle, either. 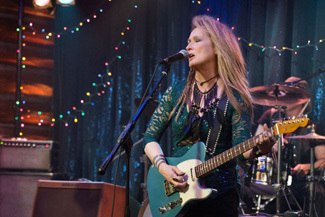 Ricki and the Flash won't earn Streep her latest Oscar nomination and will most likely get swept away into obscurity, and not because it's bad, per se, but because it just didn't make a very resounding impact. It feels like one of those movies you and your spouse might catch haphazardly on Netflix because it has Meryl Streep in it, but it's not one I feel anyone will actively seek out. With that said, I think it will cover its production budget while in theaters but will need help to cover its advertising costs. Felix Quinonez: It's not good or bad but very expected. This movie seemed like it could have been memorable but judging by the reviews and trailers, the potential of the premise seems to have been squandered. The resulting film seems very predictable and will most likely be forgotten very soon.